LG’s 55-inch OLED HDTV (model number 55EC9300) is a stunner, with a slight curve that brings the right and left edges of the screen ever so slightly closer to your eyes. And while its $3500 price tag will give most consumers pause, especially considering its resolution is limited to 1080p, that’s really not such a terrible shortcoming. There’s very little 4K content to be had today, and that situation will improve only marginally in 2015. What makes the 55EC9300 so interesting—in addition to the curve, of course—is its use of OLED technology (the acronym stands for organic light-emitting diode). OLED panels are naturally emissive, which means they radiate their own light. The backlights that LCD panels require can result in uneven brightness and contrast (the difference between the darkest and lightest images the TV can produce). LG’s panel can turn individual pixels on and off to produce extremely deep blacks and very high contrast. Picture quality was excellent when the room was completely dark, and only slightly less so when the room was filled with sunlight. Television manufacturers like LG are following the lead of movie-theater operators in offering curved displays, and I think that’s a good thing. 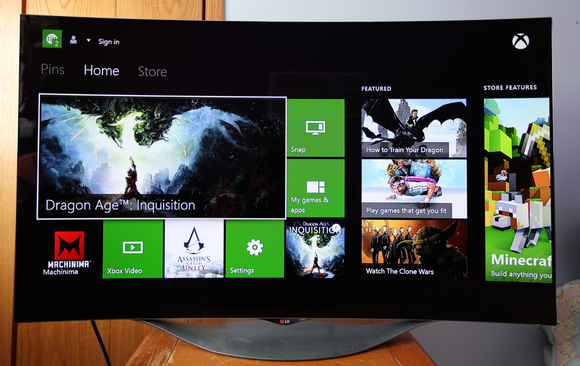 I found that the curved screen drew me deeper into the experience whether I was watching movies or playing games. Eliminating the backlight also enabled LG to make the 55EC9300’s chassis remarkably thin: LG says its depth is just 0.17 inches at its thinnest, which is about the thickness of a few credit cards. It comes with a tabletop stand, but you’ll need to pay extra to wall-mount this TV. Who would have guessed that WebOS would make such an excellent platform for a smart TV user interface (LG, apparently). LG acquired WebOS—a Linux-based operating system originally developed for mobile devices—from HP back in 2013 and built a terrific smart-TV user interface on top of it. When the TV first starts up, you almost feel like you’re playing that Flower game on a PlayStation. You operate the elongated multi-function remote control like a mouse to move a pointer over the screen to adjust the controls and launch apps, which include Hulu, Amazon Instant Video, and Netflix. The user interface is intuitive, colorful, and even fun to use. 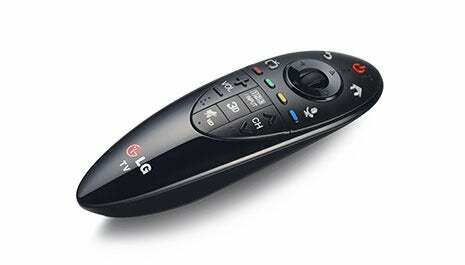 LG's Magic Remote is terrific. It wouldn’t be a smart TV without Internet connectivity, and LG provides both wireless and wired ethernet options (Wi-Fi is great, but a wired connection is always the best, if not always the most convenient alternative). The 55EC9300 also has a USB port for sharing audio, video, and photos; four HDMI 1.4 inputs (three on the side and one in the rear); composite and component video inputs; a TOSLink optical digital audio output; and an RS-232 port. And when you want to send video from a laptop, smartphone, or tablet to your big screen, there’s support for the Miracast, WiDi, and MHL (Mobile HD Link) media-streaming standards. 3D TV technology never really caught on with consumers, and Comcast recently shut down its Xfinity 3D channel (although the cable TV provider still offers HBO and Starz in 3D on demand). But LG isn’t ready to thrown in the towel just yet. If you have a 3D Blu-ray player, the 55EC9300 will help you rock the third dimension with passive 3D glasses (the set comes with two pairs, plus two sets of lenses you can clip onto prescription peepers). For the record, I found Transformers: Age of Extinction to be great fun to watch in 3D on this set. Should you jump on the curved bandwagon? It’s possible that curved displays will end up being the same flash in the pan that 3D TV was, but I hope that’s not what happens. And while OLED technology is expensive, it looks much better than LCD. I heartily recommend you check it out for yourself before plunking down this much cash, but I think you’ll find that there’s more steak than mere sizzle when it comes to curved TVs. And if you must have a 4K OLED, LG will accommodate your cravings with its flagship TV, the 65-inch curved OLED model 65EC9700. But you’d better bring your checkbook: LG expects to fetch a cool $10,000 for that TV. 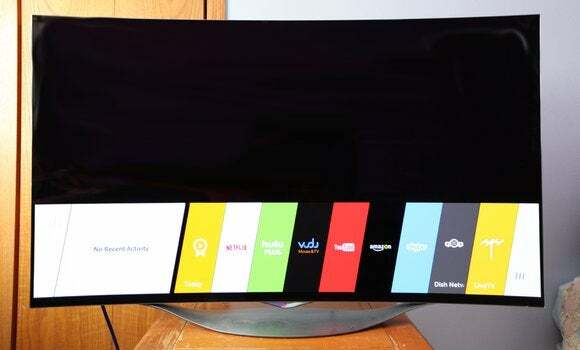 The LG 55EC9300 is an excellent TV, thanks to OLED technology, curved glass, and WebOS. It would be even better in 4K, but it would also be considerably more expensive.